Cast & Crew Shah Rukh Khan,Anushka Sharma,Katrina Kaif,Etc..
Bauua Singh is a short, 38-year-old man from Meerut who has trouble finding a marriage partner. After using matrimonial agencies with little luck, he eventually finds his companion in Aafia Bhinder, a NASR scientist (a fictionalized depiction of NASA) with cerebral palsy. In the events that followed, both fall in love with each other, but Bauua dumps her after five months. However, Aafia comes looking for him, and Bauua's parents fix their marriage. On their marriage day, Bauua's friend Guddu tells him that he is shortlisted for a dance competition where he applied, where the winner gets a chance to meet Babita Kumari. Bauua, determined to meet Babita, runs away from the marriage after a confrontation with Aafia, leaving everyone devastated. Bauua wins and gets to meet Babita at a party, accompanied by other famous Bollywood actors. Babita offers him a job after he displays an ability to guess what goes on in people's mind by observing their expressions. He accompanies her on film schedules and award functions, helping her patch up with her ex-boyfriend Aditya Kapoor, who had previosuly cheated on her. One day, Bauua realizes his wrongdoings and wishing to reconcile with Aafia, willingly creates an argument at a part organized by Babita, following which Babita throws him out and breaks all ties with Aditya, realizing the latter is cheating her again. Bauua and Guddu travel to New York, where Aafia is attending a seminar. Bauaa crashes the seminar to meet her, but Aafia refuses to see him. Aafia's father tells him that Bauua has fathered a son with Aafia and the latter is pregnant, due to which she wanted him to marry her in the first place. A heartbroken Bauua decides to leave the city, but decides to try his luck one more time. After meeting with Aafia again at NASR and getting rejected by her, Bauua enlists in a program recruiting human volunteers to be sent to Mars on a rocket. After painstaking training and getting help from one of the applicants, Bauaa gets selected, while Guddu is rejected for his vision disability. On the day of his launch, Aafia, who is supposed to marry Srinivasan, a fellow scientist and Aafia's colleague, leaves him, and she reaches NASR seconds before Bauua's launch. Bauua assures her that he always loved her, just before the rocket takes off. The launch is witnessed by Aafia, Guddu and Srinivasan, along with Babita and Bauua's family via television broadcast. The launch is successful, and the rocket thrusts off in space. In a voice-over by Aafia, it is revealed that Bauua eventually reaches Mars, and sends a video recording of himself from there. His rocket gets lost in space somewhere while returning, and Aafia waits for him, having broken her marriage with Srinivasan. Fifteen years later, a Chinese space station receives the signal of Bauua's escape pod, which crash lands in an ocean, revealing Bauua is still alive and 15 years younger. 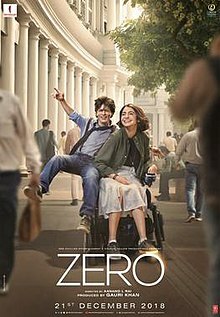 Zero (2018) Hindi Full Movie Review,Cast & Crew,Official Trailers Etc..